Description: RECTANGULAR SHAPED IVORY COLOURED ENVELOPE ADDRESSED TO MRS. T. D. DESBRISAY, LUNENBURG FROM THE WESTERN UNION TELEGRAPH CO. 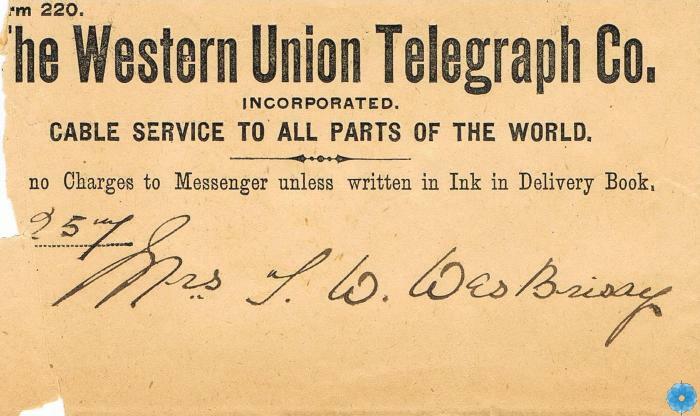 CONTAINED A HANDWRITTEN TELEGRAM FROM HER SON WILL DESBRISAY OF GRAND FALLS, NEW BRUNSWICK. History of Use: USED TO MAIL A TELEGRAM.